Fallen from grace and sheltered in a convent, Lady Edlyn is a skilled herbalist forced to secretly tend the wounds of Hugh de Florisoun. A knight renowned for his prowess on the battlefield and in the bedchamber, Hugh is no stranger to Edlyn’s heart. Using the healing magic of herbs and the power of remembered love, Edlyn saves the warrior’s life. Now Hugh claims this brazen beauty for his own. But Edlyn, cynical in the ways of men, denies him—even as her flesh burns with unaccustomed fire. 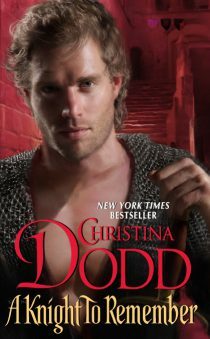 Passion becomes their battleground with no mercy given…in a bold age when danger and desire go hand in hand. I loved seeing the PBS versions of the Cadfael mysteries, about the healer-monk who pits his wits against wrongdoers. More than that, I loved seeing PBS’s rendition of Medieval England, where I have visited so many times in my mind. The second in the Knight series, A KNIGHT TO REMEMBER takes place in a similar abbey with my heroine as the healer. His voice sounded like the bleat of a newborn lamb. "If you touched me again, I’m going to rip your heart out with my bare hands." Edlyn swirled in a circle, unaware of the herbs she scattered in her flurry. Had Hugh spoken? Had last night’s administration of dragon’s blood performed a miracle? Wharton, crouched beside his master and changing his bandage, blocked her view of Hugh’s face, but before she could rush forward, Hugh spoke again. "What’s wrong with you?" he snarled in a whisper. "You’re getting me all wet." His tone changed to one of disgust. "Oh, God’s gloves, Wharton, you’re crying!" "Oh, master," Wharton stammered. "Oh, master." "You dolt." Already Hugh’s voice sounded fainter. "I’m going to beat you into dough." Wharton crept backward, groveling in the face of his master’s displeasure, and Edlyn felt the sharp prick of annoyance. Wharton had proved his devotion to Hugh over the last dreadful days, and now Hugh’s first words were nothing but bombastic threats. "Don’t worry, Wharton," she said. "He can’t beat you. He can’t even lift his arms." She walked forward and stood over her patient. "Can you?" Those hazel eyes looked up at her without a sign of recognition, and she almost laughed aloud with relief. He didn’t remember last night. "You ripped out my guts." He sounded hoarse, and reluctantly she knelt and lifted his head onto her knee. She didn’t like being so close. The weight of his head, his heat, the silk of his hair reminded her too much of last night. Pretending normality, she placed a cup to his lips. "I didn’t rip out your guts. I sewed them back in." He drank greedily, and gasped when he was finished. "I’m hungry. Why have you been starving me?" Remembering all the time she and Wharton had coaxed broth into his mouth, she wanted to hit him. He acted like a typical man who’d been ill. Angry at those who’d saved him, impatient with his own weakness, aware only of himself. Yet he wasn’t typical at all. His gaze lingered on her breasts as if he recalled touching her, then his gaze lifted to her face. He observed her – an uncomfortable feeling when one has bared one’s miserable soul in the darkness of the night. Placing him back on the rag pillow as rapidly as she could, Edlyn said, "You were wounded. We thought you would die." For the first time since he’d recovered consciousness, he seemed aware of his injury. "Wharton brought me to an abbey." His gaze swept the room. "I’ve been hidden in the dispensary." Again he looked at her. "You’re the healer." His forehead crinkled as he groped among his fevered memories. Then it smoothed. "You’re … Edlyn." "You’re Edlyn from George’s Cross," he insisted. "At George’s Cross, you were the daughter of a baron." She nodded. "And you were the son of a baron." "You learned a lady’s duties under the instruction of Lady Alisoun." He seemed lost in harmless old reminiscences. "You learned a knight’s duties under Sir David." "You were a proper girl." He didn’t recall her confession of the night before, or he wouldn’t have said that. He closed his eyes as if the effort of reminiscing had tired him. "We were children together." Children together? Is that what he remembered? Curiously, that angered her, and she shot him a glance of such scorn it should have cauterized his wound. But actually, it helped to be so angry, for someone had to peel that bandage off. "Prepare yourself," she said, and eased the clinging linen off the forming scab. He arched his back as if she’d burned him. She hurried to spread the ointment over the wound, and deep sighs of relief shuddered through him. When she bandaged him, he looked at her deeply, and she bore the examination. She wanted him to realize the girl she had been had grown up, gained skills, and saved his life. He opened his mouth to speak, and she straightened her spine. "You look the same," he said. "Pretty as ever."